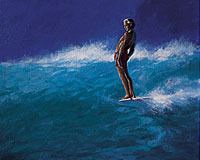 You cannot separate Ken Auster, the surfer, from Ken Auster, the artist. 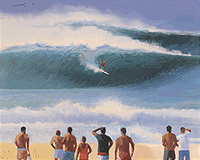 For it was in his formative years in Long Beach, California, where Ken grew up with his feet deeply planted in the surfing culture, that he first learned to express his art talent. Caught up in the ground swell of the 1960s surfing culture, Ken not only plunged into the sport of surfing but into the art and graphics of surfing as well. 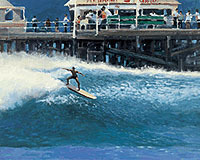 While working his way towards a Bachelor in Fine Arts degree from Long Beach State University, Ken built one of the world's most prominent silkscreen and T-shirt companies, creating now-legendary surfing art that adorned surfers from Belmont Shores to Hawaii to Mexico. 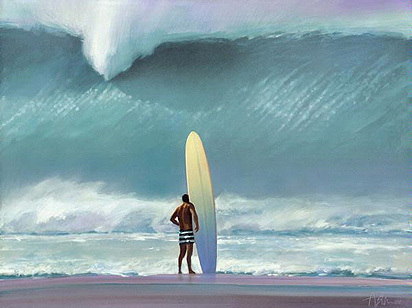 His surfing images, silk-screened as original prints on paper, became the "fine art" of this beach culture, and today, represent the classic surf art of the past century. At the heart of Ken's work was always the awareness of the fine line between man-made and nature. In the mid-1990s, Ken moved to a more serious art level - involving him with the immediacy of oil paints as opposed to the process-burdened medium of printmaking. 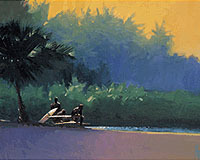 Throwing himself into the splendor of "plein air" (on location) painting, Ken discovered the richness and broad colors of the city life he long avoided. As he will tell you, he rejoiced in this newfound ability to paint anything and everything - cafes, train stations, airports, street scenes, and of course, never far away, was the beach, his first love. 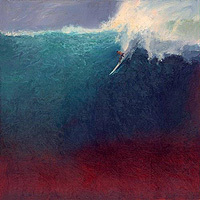 The transition from surf art to serious impressionism was natural for Ken - his passion and obsession to reach a new understanding between himself and the oil painting medium took on a new intensity of discovery. "I simply want to achieve the ultimate communication on the canvas - to say more with less," Ken says. His deft use of color. His economies of brush strokes. His simple, yet beautifully structured compositions. 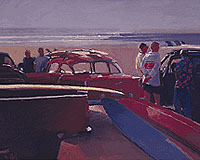 As one famous critic described - "each painting captures a moment in time charged with a hint of narrative drama. And each is rendered with such vibrant immediacy that a single glance excites other senses as well." 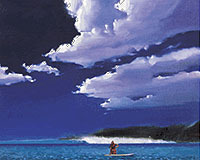 Ken's passion for painting is shared with hundreds of students who each year travel from around the world to attend his workshops in Laguna Beach and Carmel. With his life partner, Paulette Martinson, they have a thriving art world centered at their studio and gallery in picturesque Laguna Canyon. 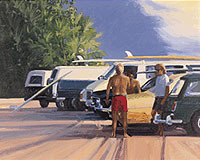 In a relatively short time since this transition to plein air painting, Ken Auster has moved to the forefront of American contemporary impressionists. 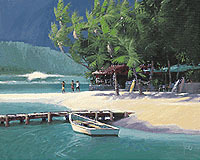 He consistently walks away with gold medals and first place awards at juried exhibits. 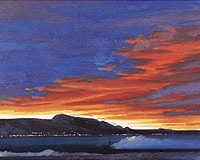 His work is collected by some of the most respected galleries and patrons. 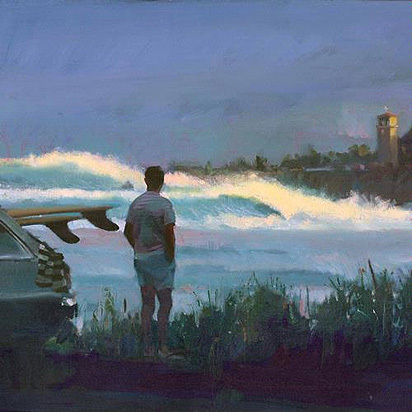 Renowned for his classic surf art, Ken Auster now sees and paints a bold, dynamically changing world, whether it is London, Venice (Italy), San Francisco, Carmel, Napa Valley, or Baja, Mexico. He shares with us the uncomplicated but moving stories on canvas - simply and effectively, documenting the ordinary in an unordinary manner. And what about his surfing? 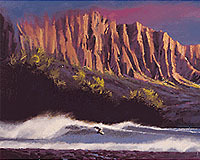 Well, if the surf is flat, you'll find Ken in his studio. 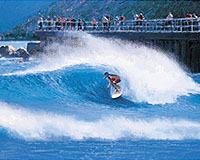 But when the surf is "up", you'll find Ken, most likely, filling his other passion.